One of the most mesmerizing sunsets either of us had ever seen, from the Cavern Point overlook on Santa Cruz Island. Many live in Southern California for years and even a lifetime without knowing that America's very own version of the Galápagos Islands exists approximately 25 miles from shore. It may not be Darwin's oceanic playground exactly, but it is a remarkable evolutionary tale all the same. Its isolated location from the mainland has enabled the evolution of endemic species of plants, animals, birds, and marine life to thrive and reproduce without incident. It is Earth as it should be – a parallel universe running aside the bustling southern California collaborative that exists on the mainland. 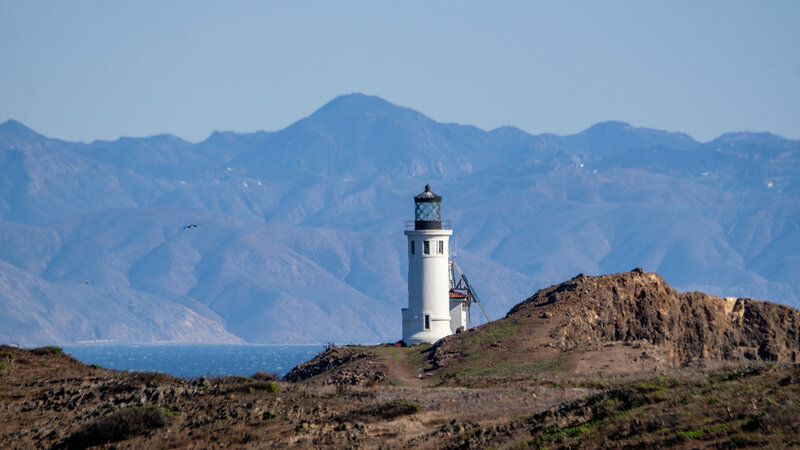 There are eight islands that make up the Channel Islands and five that make up the national park: Anacapa, Santa Cruz, Santa Rosa, San Miguel, and Santa Barbara islands. Each has its own unique contribution to the marine and terrestrial ecosystem. On the sea floor surrounding the islands, mounts, basins, escarpments and submarine canyons enable a rich bionetwork to rise to the surface in the national park. There are enormous populations of bird species living on land and offshore and large forests of sea kelp that grow in the aquatic perimeter. 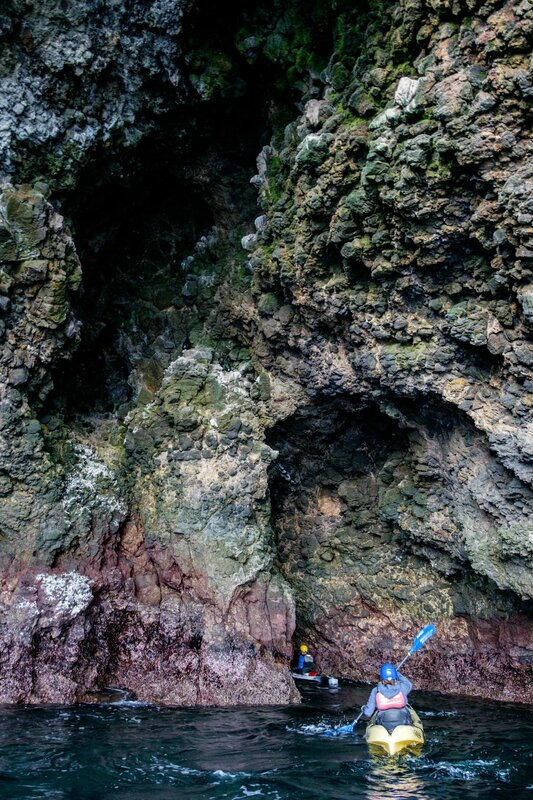 Sea caves battered by trade winds and oceanic waves form cavernous passageways within the island chain. There are enormous seal and sea lion populations across the islands as well as unique species of land mammals; and countless other phenomenal examples of a world where the footprint of humanity has barely adulterated its original makeup. Once you set foot on the islands, unique finds are everywhere – undiscovered artifacts from ancient times, remnants of the 19th century ranching era, dramatic panoramic views of the Pacific, and vibrant sunsets and sunrise skies that are part of nearly every day in the Channel Islands. 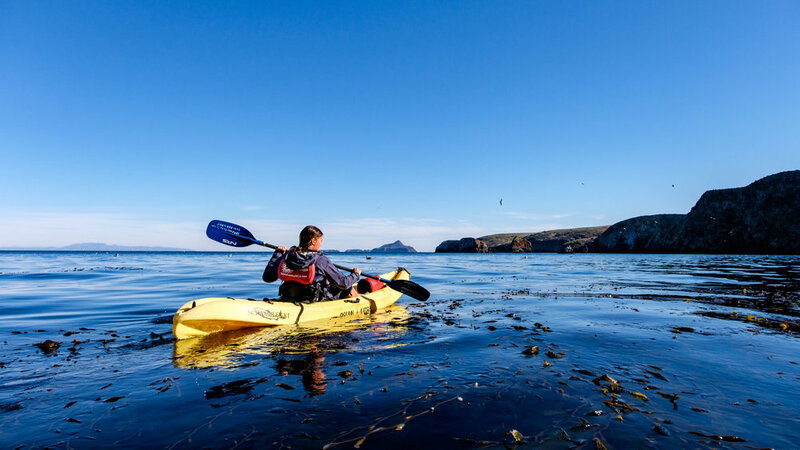 In this article, we outline each of the five islands that make up Channel Islands National Park; an provide recommendations of four awesome adventures to seek out while visiting there. Off we go! Birds soar in a golden sky in their wild habitat. Anacapa Island is known for dramatic coastal cliffs, incredible birdlife, its historic lighthouse and for being the closest to the California mainland. 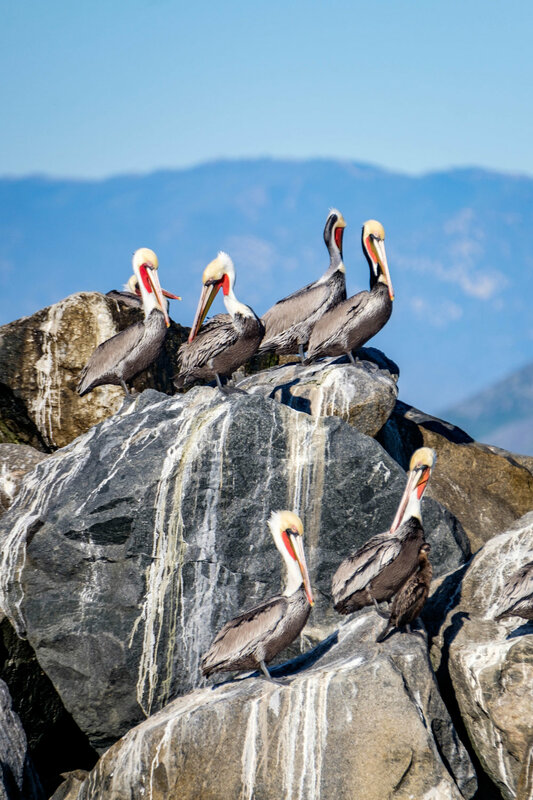 Anacapa is the closest island to the mainland positioned 12 miles offshore and is best known for having the largest breeding colony of California brown pelicans in the world. It is home to the Anacapa Island Light Station which was the last permanent lighthouse built on the western coast of the United States. This island is teeming with birdlife, dramatic cliffs, and easy walking paths around the island. 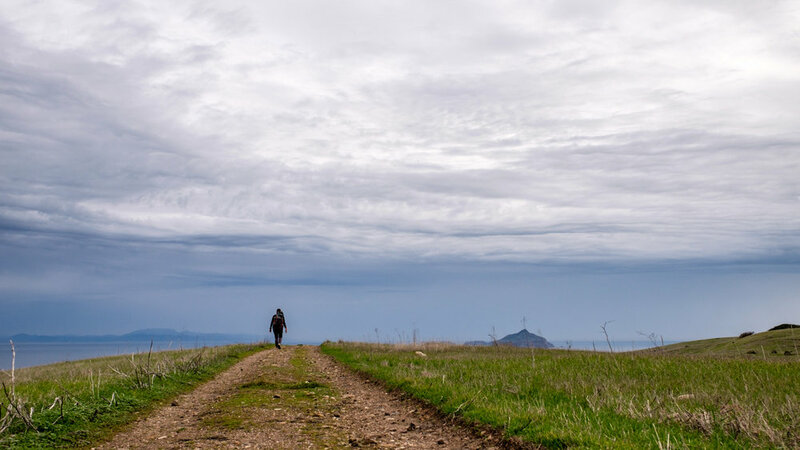 Santa Barbara is one of the least visited of the Channel Islands due to a limited passage schedule, and with no services or development on the island, it's a great place to experience a Channel Islands backcountry wilderness adventure. There are beaten trails that weave through interesting vegetation while offering dramatic coastal views in every direction. Wildflowers burst with color during winter and early spring, and there are plenty of wildlife viewing opportunities to experience year round. 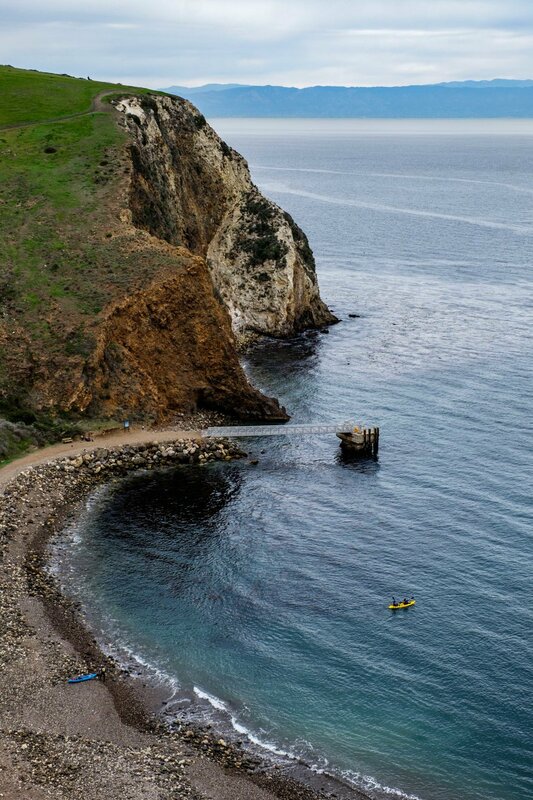 Looking down onto Smugglers Cove on Santa Cruz Island as kayakers push off into the marine sanctuary. Santa Cruz Island is California’s largest island and is also the most visited of any of the islands in the national park. 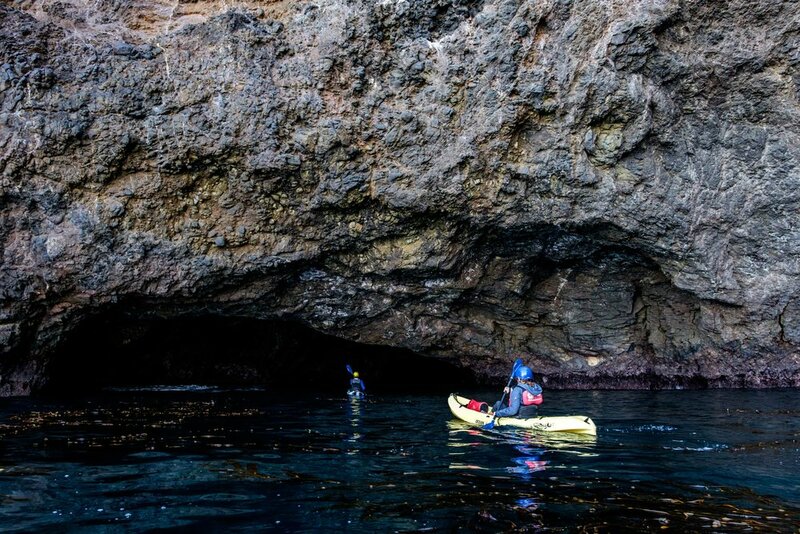 It is home to one of the largest known sea caves in the world – called the "Painted Cave" – and also to the highest peak on the Channel Islands: Diablo Peak which rises to 2,450-feet. Because of its large size, there is a wider breadth of landscape to explore on Santa Cruz. There are deep valleys, canyons, streams, springs, long stretches of beach, tide pools, terrific hikes and view points, and a wealth of wildlife peeking around every corner. For paddlers, the coastal perimeter tees up world class kayaking opportunities. The eastern end of Santa Cruz is managed by the National Park Service; the western end is owned and managed by The Nature Conservancy. On the westernmost island of the chain is a 27-mile coastline where more than 30,000 seal and sea lions (of at least five different species) bask on the beaches at Point Bennett. Together, they make up one of the largest concentrations of wildlife in the world. The best way to get up close to the colony is to hike a 16-mile round-trip route on a ranger-led hike across the island. Along the way you will have an opportunity to see a number of archeological sites that tell a small part of the story of the Chumash Indians whose ancestors lived on San Miguel almost continuously for nearly 12,000 years. Santa Rosa is known for its diverse endemic plant and animal species, including a subspecies of one of the rarest pine species in the world, the Torrey pine – a remnant of the once widespread Pleistocene forest. With more than 100 species of birds, this island is a birder's paradise! And for those keen on wildlife sightings, there are plenty of opportunities to commingle with land-based species while hiking the island. Off the coast lives extensive forests of sea-kelp and other marine wildlife in the cold Pacific waters. This is also a prime spot for backcountry camping. There are no public phones, accommodations, services, or any other signs of man, really, offering visitors a chance to completely untether from the outside world. 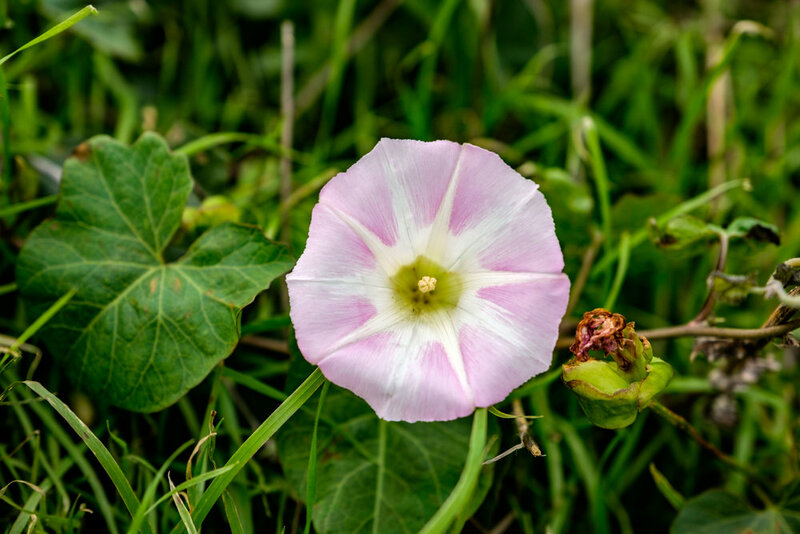 Wildflowers come to life on the islands during winter and spring. Sea kelp forests are healthy in all areas of the national park. 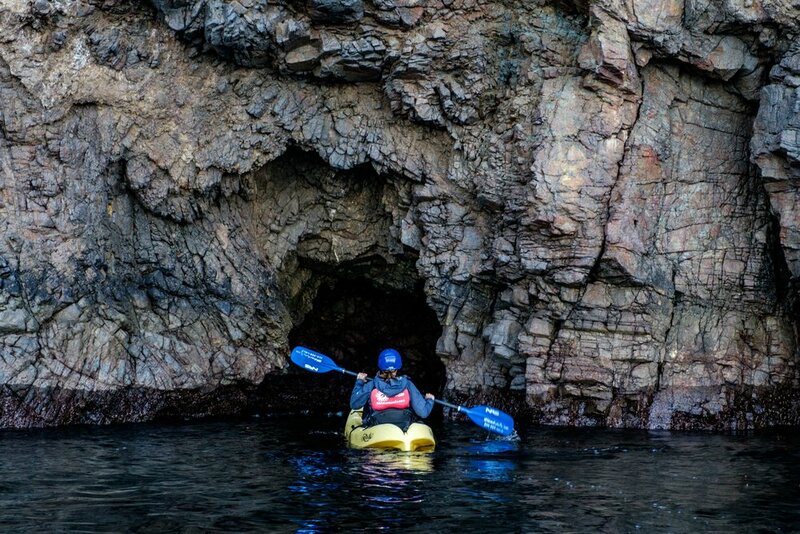 Four Outdoor Adventures in Channel Islands National Park! 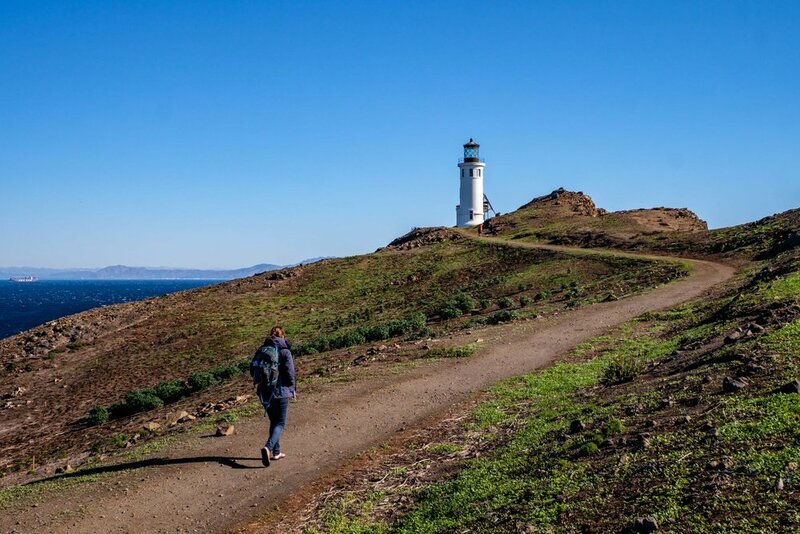 After disembarking the Island Packers ship, the first activity for many is a short hike to the Anacapa Island Light Station. A view of Channel Islands National Park from Inspiration Point. Santa Cruz Island is the the most visited of the five islands in the national park, has the best weather, and has the most frequent ferry schedule coming in from the mainland. The top recreational activity on Santa Cruz is hiking. Hitting the trails in the Scorpion Valley allows for relatively easy outings on maintained trails; while the trails in the mountainous Montañon area are much more rugged. 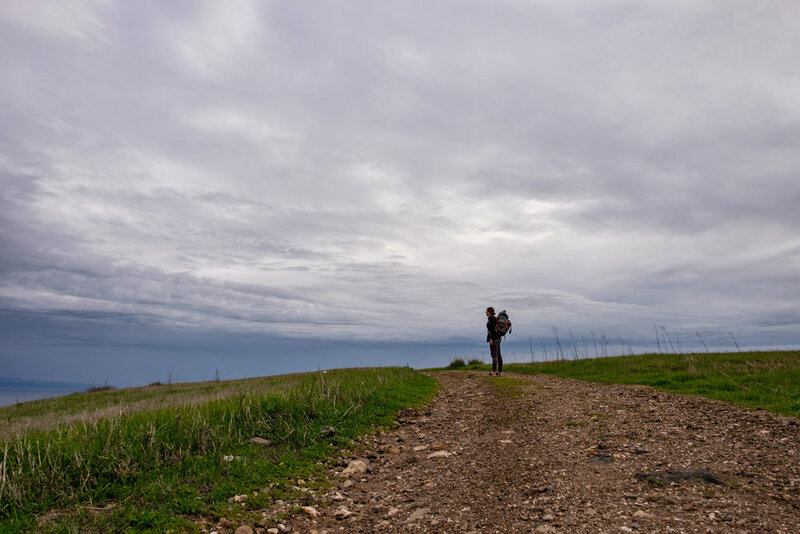 Along the 4.5-mile Scorpion Canyon Loop trail in the Scorpion Valley network, trekkers have the unique opportunity to see the island scrub-jay, a species of bird that can only be seen on Santa Cruz Island. We recommend hiking clockwise from the trailhead near the boat dock at Smugglers Cove to avoid a brutally steep climb that begins at the Scorpion Ranch Campground. Along the hike you will see endemic Santa Cruz Island foxes, beautiful flora, and incredible views of the California coastline. The Scorpion Ranch Campground near Smugglers Cove is one of the best developed camp grounds in the park system. Obviously, it is not RV equipped as there are no vehicle passenger ferries nor is there road-equipped infrastructure on the islands. You must carry in all of your gear on your back and rangers will meet you at the boat dock to assign you your spot (advanced reservations are required.) Scented items including food will be kept in food storage lockers to prevent scavenging birds, mice, and Santa Cruz Island foxes from making a meal out of your reserves. Starting from the multi-tiered camping area there are several excellent hiking trails that suit a variety of ability levels. At Scorpion Beach nearby, you can comb for shells and historical artifacts, watch for island foxes, and launch a sea-based adventure into the coastal marine sanctuary that skirts the island. One place not to miss on Santa Cruz if you are camping there is the Cavern Point overlook on the high point of the island, where for us the sky opened up and blessed us with one of the most glorious sunsets of the year (and maybe our lives.) It just continued to explode with color with every passing second (see featured photo.) It takes about one hour to walk there from the campground, allowing you to get back just as night falls. Our campsite at the Scorpion Ranch campground on Santa Cruz Island was relatively quiet when we were there during off season. Perfect. 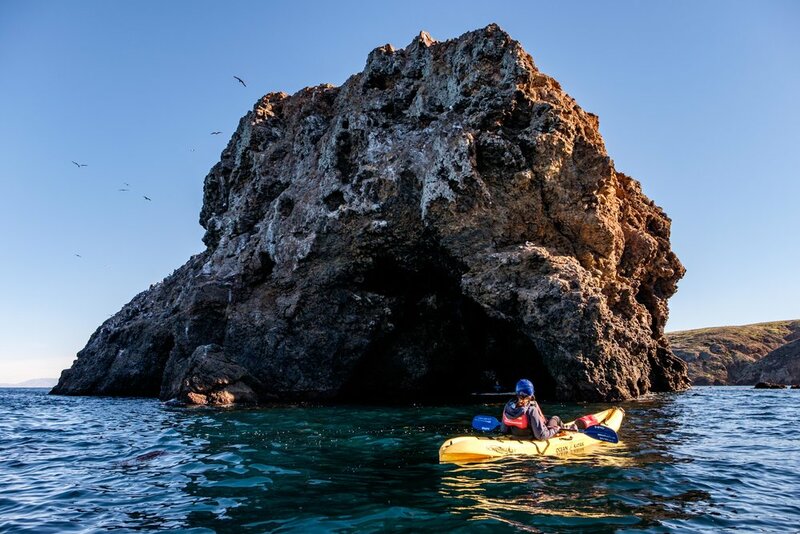 Some of the best aquatic wildlife and bird-viewing opportunities on the western coast of North America can be found while kayaking the rocky shorelines of Channel Islands National Park; it is also a prime spot to kayak through sea-based cave systems! Our guide for the day, Laird, from the Santa Barbara Adventure company was exceptional – and we’ve been with plenty of guides in our traveling lifetime. What made him so great was his keen attention to detail and his knowledge and insistence upon safety. We never felt as though we were missing something really cool, even when we couldn’t enter certain areas due to rough conditions. 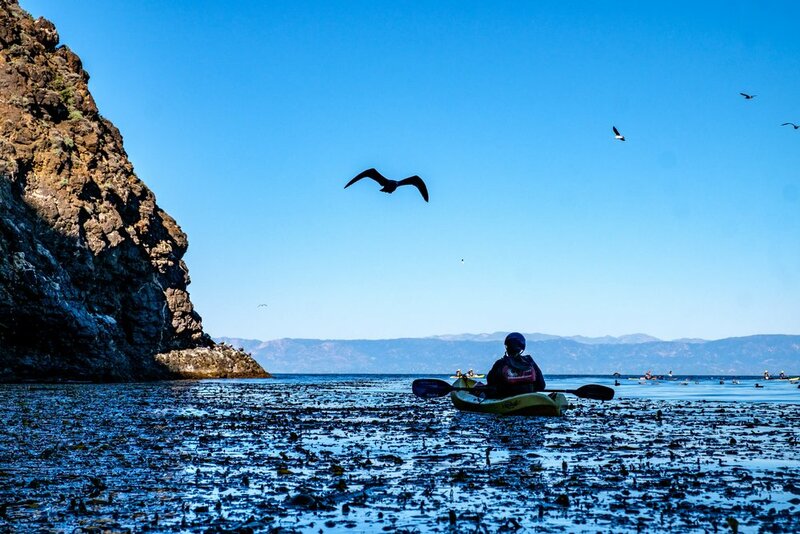 For the better part of a day, we paddled through kelp forest habitats, navigated countless sea caves and rock formations, came face-to-face with seals and sea lions, and glided across dynamic waters beneath seabirds that soared with wild abandon. 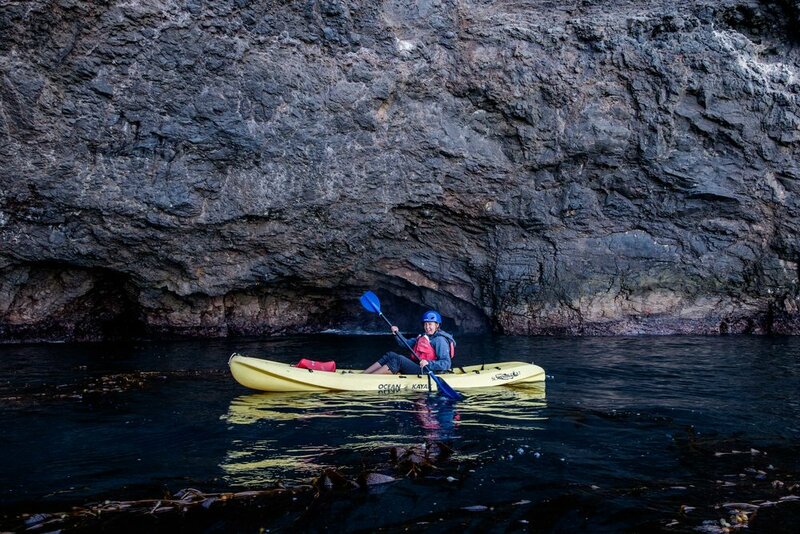 This adventure was one of our favorite of the year and is a must if you love sea kayaking. 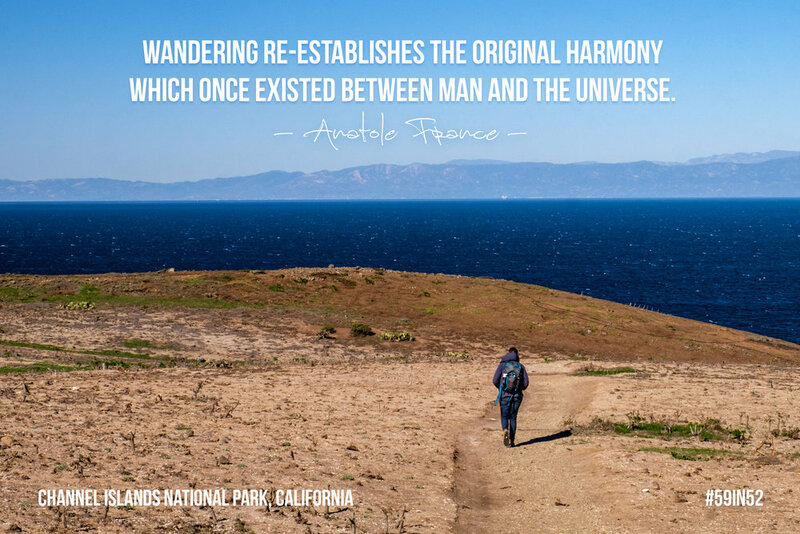 Iconic site in the park: The view of the Channel Islands from Inspiration Point on the west side of Anacapa Island provides a linear look of the four other islands that make up the national park. The overlook stands at 936 feet where a drop falls before you, so stand clear of the edge! 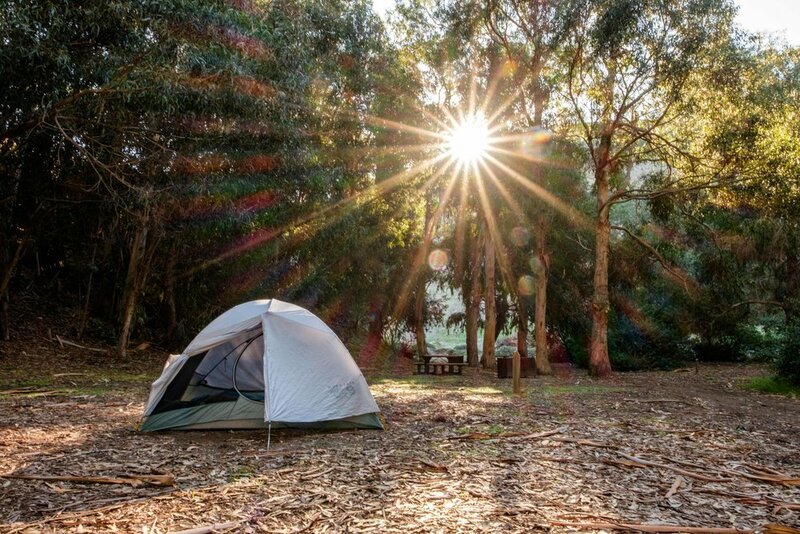 To get your perfect sunset photo of this spot, you will want to stay to camp overnight. A view of the Channel Islands from Inspiration Point on Anacapa Island. Accessible adventure: The concessioner boat ride with Island Packers to Anacapa Island takes just an hour each way and presents marine- and bird-life viewing opportunities, interpretive talks given by Island Packers guides, and a comfy voyage across the channel with full-service eats and drinks along the way. While the passage is cushy, landings can get rough depending on conditions – we had a harrowing departure from Anacapa due to unexpected turbulent trade winds and wild waves. The staff impressed us completely as they passaged us from the dock into the boat (keep in mind that we were there during off-season when the waters are at their roughest.) For us, the unexpected adventure made it all the more fun – because we never felt unsafe, the drama made this experience all the more exciting. If you have children and/or elderly companions, we recommend planning this excursion during summer months when the seas are at their calmest. 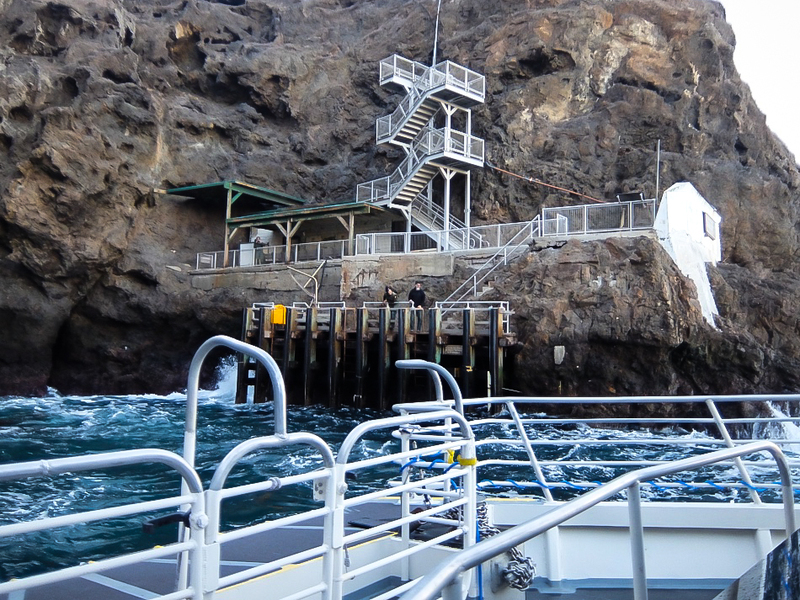 The boat dock at Anacapa Island requires a little effort to climb onto. The Island Packers boat that cruised us into the harbor on Santa Cruz Island. 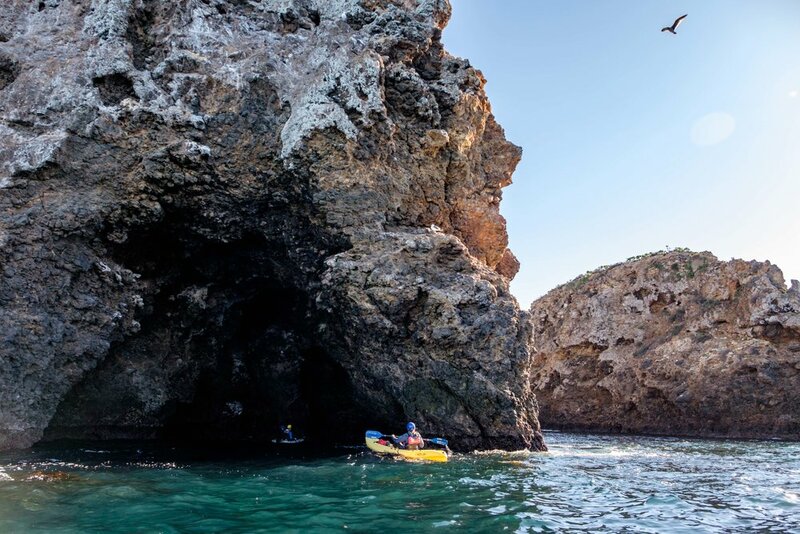 Big adventure: Cave kayaking on Santa Cruz Island is one of the coolest ways to explore the Channel Islands. 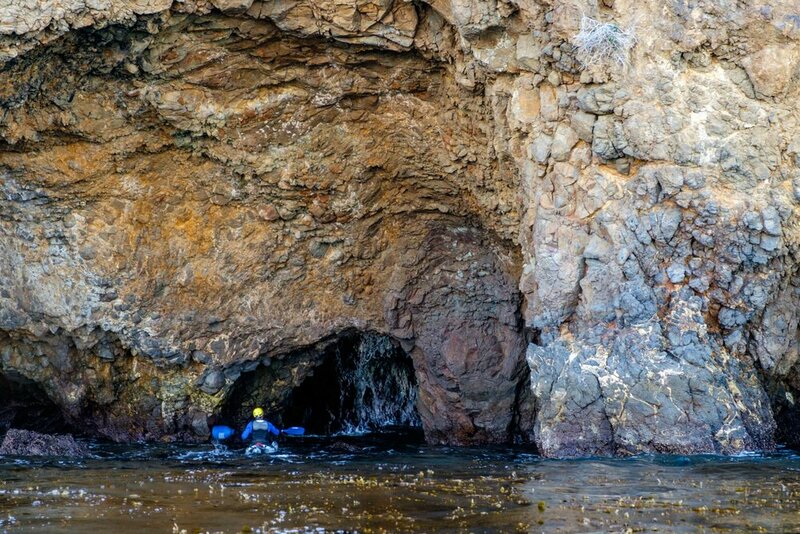 With more than 200 mapped sea caves – the highest concentration of navigable sea caves in the park – intrepid explorers comfortable paddling sometimes choppy waters that the Pacific is known for have an opportunity to drift into areas where the land meets the sea. We traveled with the Santa Barbara Adventure Company, and as we noted in the article above, their guides are not only world class in terms of knowledge, but traveler safety is clearly their top priority. As experienced paddlers themselves, they know a lot (and care a lot) about the area and are eager to pass that passion on to new visitors. If you are comfortable in a kayak – comfortable, but you need not be a pro – this is a top experience in this park!! 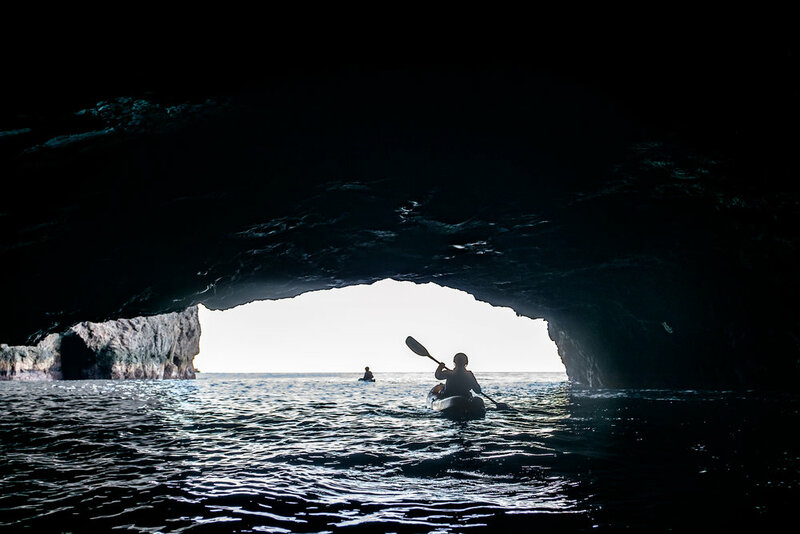 Kayaking through a cave in the Pacific Ocean. Sublime!! Laird, an experienced guide with the Santa Barbara Adventure Company, talks safety before heading into the cave. 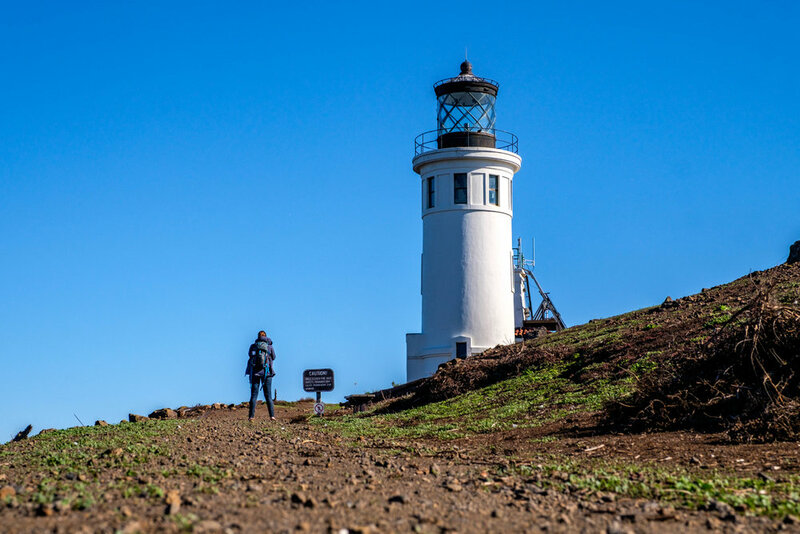 The Channel Islands National Park Visitor Centers are located in Ventura and Santa Barbara on the mainland where rangers are on hand and ready to help you find your way to the islands. 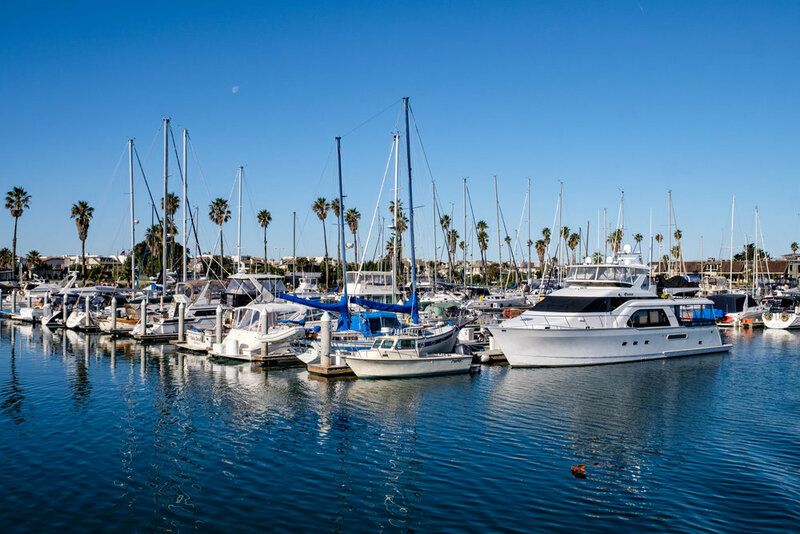 Access is available by plane with Channel Islands Aviation out of Camarillo; and by one of several concessionaire boats operated by Island Packers. Whichever way you choose to arrive, you will want to line it up in advance as seats fill up fast, especially during summer months. There is no transportation on the islands... you'll have to go by boat or on foot to get around! Transportation doesn’t exist on the island and there are no roads. All areas must be explored on foot, or by private boat or kayak. The Channel Islands is an active ground for more than 2,000 plant and animal species, 145 of them exist nowhere else on Earth. Non-native species including rats, burros, rabbits, and feral cats have been eradicated from the islands through efforts made by the National Park Service. The only breeding colony of northern fur seals south of Alaska exists on the Channel Islands. These islands are an important breeding and resting and migratory area for many species of land birds, shorebirds, and seabirds. In 2006, a bald eagle was able to hatch a fledgling on Santa Cruz Island without the assistance of scientists for the first time in 50 years. The reason the birdlife at Anacapa is so immense is that there are few predatory species of wildlife living on the island. 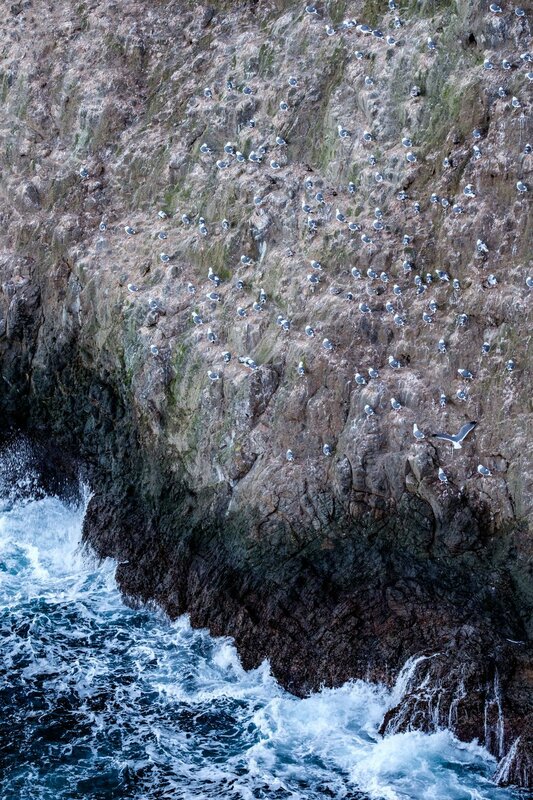 The Channel Islands is one of the best birding destinations in North America. The largest breeding colony of California brown pelicans in the world can be found on the west side of Anancapa Island. 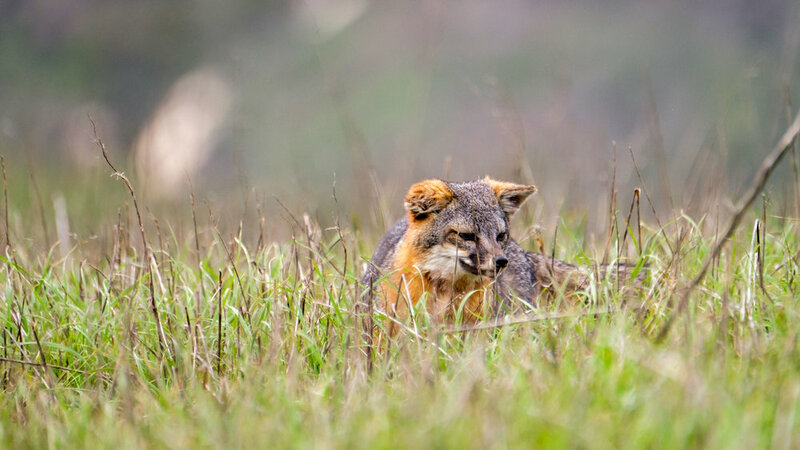 The Santa Cruz Island fox lives only on Santa Cruz Island. The island scrubjay and the Santa Cruz Island fox can both only be found only on Santa Cruz Island. In 1978, The Nature Conservancy purchased the majority of Santa Cruz Island to help save it from invasive species including feral pigs and sheep (who overgrazed land); to help save the Santa Cruz Island fox which was on the brink of extinction; and to prevent the golden eagle – which moved in from the mainland preying on endemic species – from wiping out populations island foxes, the top predator on the island for millennia.The Channel Islands National Marine Sanctuary extends six nautical miles around all five islands in the national park. Grey whales migrate through the Channel Islands during the North American winter. Island Packers, the concessioner who runs boats to the islands, also offers whale watching experiences along the coast. Santa Cruz Island – the largest island in California – is nearly three times the size of Manhattan. It is 24 miles long, ranges up to 6 miles wide, and has 77-miles of shoreline. Recreational activities abound on all of the islands – snorkeling, diving, sea kayaking, backpacking, hiking, camping and wildlife watching opportunities are some of the most popular. Fishing and diving excursions are strictly regulated in the park and aircraft is required to keep their distance to not upset the bird and marine habitats. Park rangers live on each of the five islands permanently conducting research and providing guidance and safety while there. Visitors can camp on any of the five islands year round. Advance reservations are required. All camping areas in the park are pack-in-pack out. Each of the five islands has a ranger living on it permanently. From Santa Barbara on a clear day, you can see Catalina Island off in the distance. It is the most famous of the eight Channel Islands but is not part of the national park. 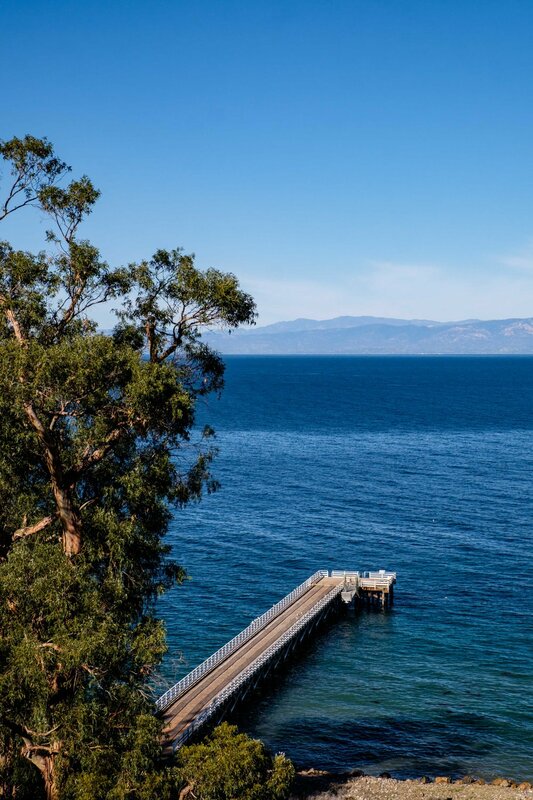 In the early 1800’s, the islands were inhabited by Chumash Indians who traveled between its shores in canoes made of endemic wood and hardened tar from oil discharge coming from oil rich earth beneath the Pacific. They used the tar, called bitumen, in a variety of practical uses such as roofing, waterproofing, and to make roads. Remnants of the tar can still be found on the beaches. 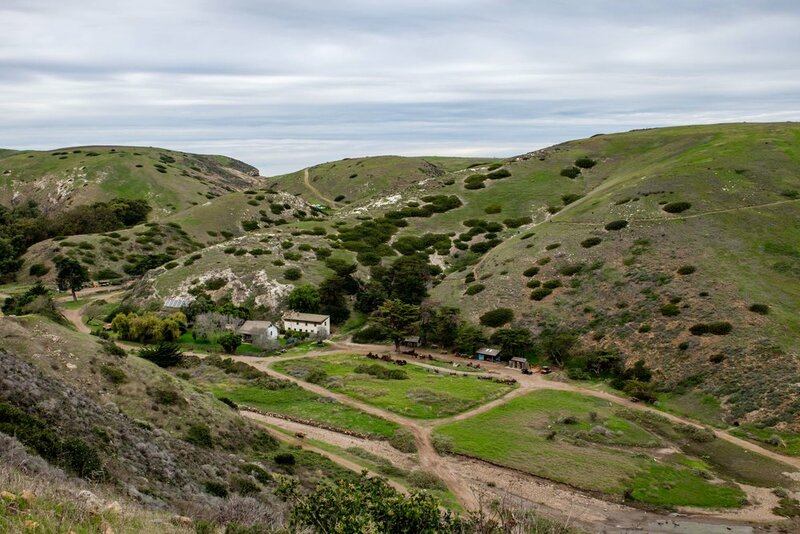 On San Miguel Island, there are 600 archeological sites that are remnants of the Chumash Indians. The oldest human remains in North America were discovered on Santa Rosa Island in 1959. They date back to 13,000 B.C. The rocky sea bottoms make this area a mariners’ nightmare. Landing conditions on Santa Cruz and all of the islands vary based on costal activity. Bring your water shoes! You never know when you will need to step into the ocean from a boat or skiff to make landfall. The Channel Islands rose above the sea more than five million years ago due to tectonic forces. The Anacapa Island Light Station was first turned on in 1932. It is the longest operating lighthouse on the west coast of the United States. The national park manages a decades long ecological research program to help study and protect flourishing kelp forests that is home to nearly a thousand kinds of fish and marine plants. If you come across an artifact on the island, take a photo of it, mark its location in your mind, leave it where it is, and head to the National Park Visitor Center to learn about your find. The Anacapa Island Light Station was turned on in 1932. Sea kelp is a vital nutrient source for many species in the area, underwater, at sea level, and in the sky. Unlike most of the national parks, there is cell service on the islands. Got to love LA – always connected! Channel Islands National Park welcomed 364,807 visitors during the centennial anniversary year. We visited in December 2016. Santa Cruz Island is the most visited. Because it is the largest of the islands in the park, it has boundless opportunities for hiking, camping, wildlife viewing, and general exploration. A special thanks to National Geographic, Fujifilm, and Airstream for making this project possible.